WHO DID YOU SAY STARTED THIS MARCHING BUSINESS? Science for the People is a left-wing organization that emerged from the antiwar culture of the United States in the 1970s. There have been various attempts to revive the group in different forms, including one effort in 2002 and another that has emerged since 2014. I was a founder in 1969-70 of Science for the People. It originated in the coming together of the then one-year-old Scientists and Engineers for Social and Political Action (SESPA) and a group of Harvard and MIT students who had been invited to participate in a session of the AAAS annual meeting. 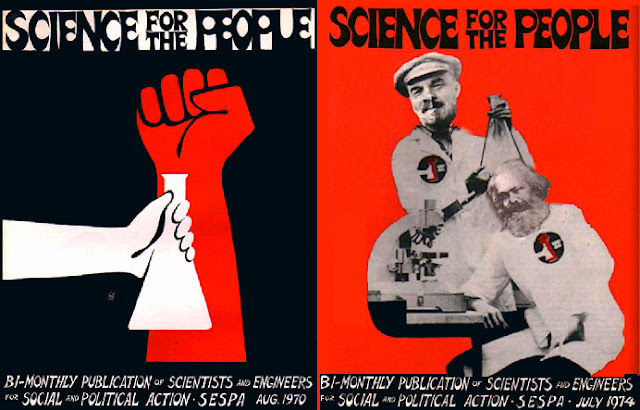 SESPA itself was formed in the aftermath of a struggle... to get the APS to take a stand against the Vietnam war....The first issue of Science for the People (1970) was produced and edited by me with a comrade who is now my wife. Subsequent issues were produced by ever changing editorial collectives. Over its first few years SFP ...became an outlet for critical discussion of the misuse of science. In the process it became identified with well-known critical academic scientists such as Stephen Jay Gould and Richard Lewontin. Social Thought and Political Economy (STPEC) program at the University of Massachusetts Amherst will bring together members of Science for the People (SftP) from the 1970s and 1980s as part of a April 11-13 conference on the history of the organization and its approach to enduring questions of power, ideology and democracy in science. If 90% of published papers are junk, and 95% of the remainder pretty boring, why expect blog comments to be any better? Therefore there are none. Authors of indignant Letters to the Editor should note that satire is just a V short of Veritas spelled backwards.